A few of us were discussing our bridal party today in rehearsal, and I was surprised at how many ladies agree that smaller is probably better. Seriously, there are nine groomsmen in that photograph. Does that guy really need that much man-support, or is that how many dudes it took to carry him back to his dorm room in college? 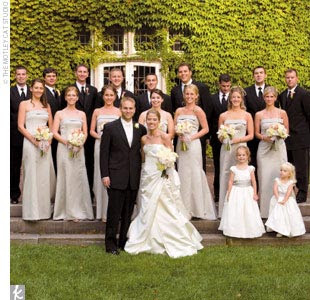 And seven bridesmaids and two flower girls? For those of you who know me, you'll agree that giving me control of 18 people and a new husband in a single day would be dangerous. I cannot be the boss of all those people and keep my head on straight. Which is why I'll have a maid of honor. And maybe a bridesmaid, at most. I like most of you too much to subject you to my crazy.